"This is one of my most-requested dishes, and it's perfect for Easter, Thanksgiving, or anytime you need a fancy side dish. It looks much more difficult to make than it is, and guests are always impressed! Even people who don't like sweet potatoes ask for second helpings! I hope you enjoy it too. Maple syrup can be substituted for the vanilla extract." Bring a large pot of lightly salted water to a boil over medium-high heat. Add sweet potatoes, cover, and cook until soft, about 10 minutes. Drain, and set aside. Preheat oven to 375 degrees F (190 degrees C). Lightly grease a 2 quart souffle dish. Sprinkle dish with 1 tablespoon white sugar, shaking dish to evenly coat bottom and sides. Place the sweet potatoes into the bowl of a food processor. Add the butter, 3/4 cup sugar, heavy cream, eggs, cloves, nutmeg, cinnamon, vanilla, and salt. Process until mixture is smooth. Pour into prepared souffle dish. 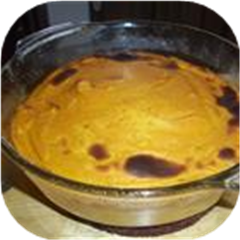 Bake the sweet potato mixture in preheated oven for 20 minutes. Lower oven temperature to 350 degrees F (175 degrees C). Bake the sweet potato mixture until edges are slightly browned, about 40 minutes more. Serve warm or at room temperature.